Actual good news here - at least partially. Tax revenue has almost bounced back to pre-recession highs as of year end 2010. This is a much needed event, considering so much money has come into the states the past few years via federal stimulus. Of course spending has increased during that time, since government is always expanding (plus all those public worker healthcare and pensions costs) so revenue levels of 2011 need to eventually get much higher than those of 2007/2008 to keep pace. What would be interesting to know, but is immeasurable do to all the moving parts, is how much of this rebound in revenue is due to higher taxes & fees versus a general increase in economic activity. Further the states are doing better than the local municipalities, since the latter relies far more heavily on property taxes. State and local tax revenue has nearly snapped back to the peak hit several years ago—a gain attributed to a reviving economy and tax increases implemented during the recession. But the improvement masks deeper problems for state and local governments that are likely to linger for years. To weather the recession, state governments relied on now-depleted federal stimulus funds, which allowed them to put off painful cuts that would have otherwise been necessary to balance budgets. Meanwhile, demand for government services and the tab for public-worker pensions and health care have continued to grow. Total tax receipts for state and local governments hit $1.29 trillion in 2010, just 2.3% shy of the $1.32 trillion taken in during 2008, not adjusted for inflation, according to Census Bureau data. Peak tax revenue was reached during the first year of the recent recession, which began in December 2007, due to the usual lag between the time a downturn hits and when it is reflected in tax receipts. 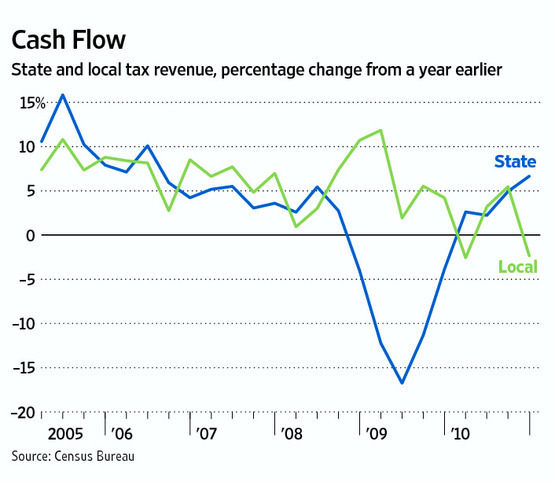 The latest tallies show a diverging trend in the fiscal health of state and local governments. While state tax revenue increased every quarter of 2010, including a 6.7% jump in the fourth period compared with a year earlier, local tax revenue fell in the first and fourth quarters—in part because of slumping real-estate tax receipts. While states are primarily funded by sales and income taxes—which tend to grow along with an expanding economy—the nation's 89,000 cities, school districts and other local governments depend heavily on property taxes. Local "governments are still very much in the midst of the downturn and are likely to have a couple of tough years ahead," says Chris Hoene, director of research for the National League of Cities, adding that local governments will struggle until there is a rebound in housing markets. State income-tax revenue jumped 10.9% in the fourth quarter of 2010 compared with a year ago, as Americans' healthier incomes and stock-market gains translated to higher income-tax payments. Sales taxes grew 1.9% over the period, according to the Census. While state finances are improving, their current fiscal woes largely reflect lingering problems that have yet to be resolved. For decades, the cost of state and local government has risen faster than overall inflation, in part because of pension and health-care promises governments made to their employees. Meanwhile, in the 2012 fiscal year that starts in July, states will no longer have the roughly $150 billion in stimulus funds that over the past two years have been used to fill gaps in states' budgets. That means governors and legislators are just now considering cuts that, but for the stimulus, would have been made years ago. The growing stress on local governments is likely to put more pressure on state budgets, even as states' own revenues improve. State and local finances are intertwined, with states paying for many local services. Also, cities' fiscal woes can raise doubts among bond investors about a state's fiscal health.